The speed of sound depends on the medium through which sound waves propagate. The speed of sound differs in air and water, with sound waves traveling faster in water. For example, in air at a temperature of 18°C (64°F), the speed of sound is approximately 341 meters (1,120 feet) per second. In contrast, in salt water at approximately the same temperature, the speed of sound is approximately 1,524 meters (5,000 feet) per second. The crew of Le Suroit prepare to launch deep-sea sonar in 1985 during a search for the wreck of the Titanic. Sonar (sound navigation and ranging) uses sound to locate and identify targets, whether shipwrecks, submarines, or schools of fish. The state properties of water (temperature and pressure) and the degree of salinity also affect the speed of sound. The propagation of sound waves in sea water can be directly affected by suspensions of particulate matter that can scatter, absorb, or reflect the waves. Laboratory experiments demonstrate that distilled water—water from which salts and other suspended particles have been removed—provides a medium in which the speed of sound exceeds the speed of sound in ocean water. The difference in the speed of transmission is significant—speed in distilled water may be 20 to 30 times that of speeds found in ocean water. Because frequency and wavelength are inversely proportional characteristics of sound waves, low-frequency signals produce long sound wavelengths. These long-wavelength signals encounter fewer suspended particles as they pass through the medium and thus are not as subject to scattering, absorption, or reflection. As a result, low-frequency signals are able to travel farther without significant loss of signal strength. Naval communication systems utilize low-frequency, long-wavelength signals to enhance communications with submerged submarines. Physical Differences Produce a "Sound Channel"
Within the ocean, the speed of sound varies with changes in depth that accompany normal changes in temperature and pressure. Specific combinations of temperature, pressure, and salinity may act to create shadow zones, or reflective layers, that are resistant to the propagation of sound waves. A specific set of conditions, however, also act to create a channel through which sound waves propagate at minimal speed but with minimal loss of strength. Similar to the transmission of light through fiber-optic cables, the refraction (bending) of sound waves by layers of water with varying temperature, pressure, and/or salinity allow the formation of a well-defined sound channel. Although the oceans are not uniform bodies of water—there are currents of water with dramatic variations of temperature (such as the Gulf Stream) and salinity—the speed of sound in the deeper regions of the oceans is influenced more by high pressure. Conversely, at shallower depths, temperature plays the most dominant role in governing the speed of sound. The greater the temperature of the water, the faster sound travels. Surface temperature variation can be significant with seasonal variations in the amount of sunlight (insolation) that can produce changes in near-surface temperatures that, in turn, affect the speed of sound in water near the ocean surface. When the near-surface layer is well mixed by currents and surface action, a resulting isothermal layer allows uniform propagation speeds for sound waves. Such isothermal layers are common in mid-latitude regions. A temperature gradient exists when the temperature of the water decreases with increasing depth. The resulting thermocline shows a characteristic decrease in the speed of sound with decreasing temperature. However, at a depth of approximately 750 meters (2,460 feet), the variations in temperature become so slight that the water becomes essentially isothermal (of uniform temperature). From that point, the speed of sound is regulated more by changes in pressure that accompany the increasing depth. Because sound wave transmission speed is directly proportional to pressure, the speed of sound increases as the pressure increases with depth. Accordingly, at the interface of the thermocline and the isothermal depths, there exists a region of minimal speed of sound. This interface creates a sound "pipeline," or "deep sound channel," within the oceans that allows the transmission of low-frequency sound over thousands of kilometers. This sound fixing and ranging (SOFAR) channel was discovered in 1943 by an American team led by Maurice Ewing and J. L. Worzel, and independently by Soviet physicist Leonid Brekhovskikh. Ewing and Worzel demonstrated that the SOFAR channel was capable of transmitting the low-frequency, long-wavelength sound waves produced by an explosion near the Bahama Islands to receivers stationed near the coast of Africa. SOFAR channel depths also are a function of the depth and thickness (extent) of the thermocline. For example, SOFAR channels run nearer the surface in colder, polar seas. Temperature and pressure affect water density, and the refraction of sound waves occurs at the interface of mediums (or layers within a medium) of differing density. Because of refraction, sound waves traveling through the SOFAR channel are deflected toward a region of lower velocity. Accordingly, waves traveling upward toward the surface, where the speed of sound increases with increasing temperature, deflect downward. Waves traveling toward deeper water, where the speed of sound increases with increasing pressure, are deflected upward. Sound waves can be trapped effectively in the narrow SOFAR channel. Traveling at minimum velocity, the sound waves lose little energy, allowing the waves to propagate over distances in excess of 25,000 kilometers (15,500 miles). Prior to the widespread use of GPS (global positioning system) equipment, the SOFAR channel also was used for navigation and the location of marine craft. Some scientists hypothesize that certain species of whales utilize the SOFAR channel to communicate mating calls over long distances. 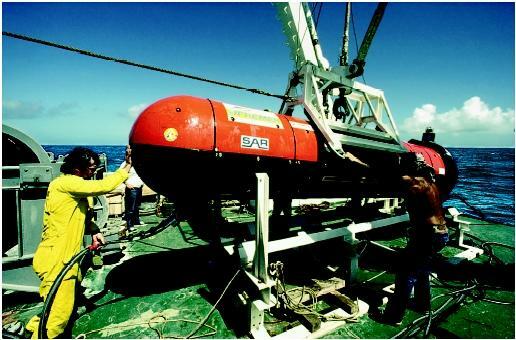 Based on the known relationship of temperature changes to changes in the speed of sound, the Acoustic Thermometry of Ocean Climate (ATOC) project is attempting to provide data crucial to measurement of changes in global temperature. By measuring differences in the speed of sound transmitted over long distances (such as across the Pacific basin), data accumulated over a long timeframe should average out variations in temperature and salinity, enabling ATOC scientists to calculate changes in ocean temperature that may provide evidence related to questions regarding global warming. SEE ALSO Marine Mammals ; Oceanography, Physical ; Sea Water, Physics and Chemistry of. Baggeroer, A., and W. H. Munk. "The Heard Island Feasibility Test." Physics Today 45 (1992):30. Munk, Walter, Peter Worcester, and Carl Wunsch. Ocean Acoustic Tomography. Cambridge, U.K.: Cambridge University Press, 1995. Rossby, T., and D. C. Webb. "Observing Abyssal Motions by Tracking SwallowFloats in the SOFAR Channel." JMR 17 (1970):365. Scripps Institution of Oceanography. Explorations 5, no. 2 (fall 1998).